CLARKSBURG, W.Va. – Readers of “The Independent Voice of North Central West Virginia” – The Exponent Telegram – Clarksburg’s only newspaper, have only a frail grasp on the big picture, at least when it comes to understanding the implications of the natural gas boom in the region. That is because the newspaper’s president, Brian Jarvis, is also the president of Hydrocarbon Well Services, an oil and gas service company with 15 rigs, according to Jarvis’ LinkedIn site. Also, according to his LinkedIn site, Jarvis is an attorney representing gas and oil interests, work he continues following a stint with Jackson Kelly PLLC, a leading gas industry law firm with five offices in West Virginia – including Clarksburg – as well as five other states and Washington, D.C. Jarvis worked there for more than three years, from September 2008 – January 2012. Clearly, these business interests of Jarvis call into question the newspaper’s independence when covering the gas industry. Indeed, in late January, approximately 10 environmental leaders met with an official with the newspaper to challenge the newspaper to provide more comprehensive coverage of the gas industry. Ironically, on the day of the visit, a gas line explosion that had occurred the day before in Brooke County, W.Va. got no mention in the newspaper. This is not surprising though, as the newspaper closed out 2014 with a tribute to the gas industry. In its December 30, 2014 issue, the front page declared, “Marcellus Shale authors statewide success story.” In the article, the newspaper proclaimed, “The Exponent Telegram’s Editorial Board has named the Marcellus Shale development as the Success Story of the Year.” Additionally, in its lead editorial in the same edition, the newspaper uncritically adopted the energy industry’s assertions of its benefits, despite the overwhelming scientific evidence that the harm to public health and safety, as well as the environment, far outweighs any perceived benefit. Nowhere in the article or the editorial did the newspaper disclose interests held by Jarvis in the gas and oil business. Of course, the newspaper also enjoys significant advertising revenues from gas industry giants such as Dominion Resources, Inc.
One would presume that Harvey is referring to issues such as the hazards associated with the gas industry, such as site development and well pad activity, traffic congestion, water use and contamination, air pollution, waste disposal, public health issues, quality of life issues, misuse of eminent domain in pipeline development, climate change, potential earthquakes, and questionable claims of economic revitalization. The newspaper has simply not covered those issues at all, let alone dug deep into them. There could not be a more ironic statement from a representative of The Exponent Telegram. Because they are not being the watchdogs they claim to be, West Virginians are headed for the endangered species list. The reading public deserves better. Jarvis should divest himself of all interests in – and income from – the gas industry. Until and if he does, the newspaper lacks all credibility, despite Harvey’s claims. The Eagles were right. Journalism is dead and gone – at least in print, in Clarksburg. If you value authentic, independent investigative journalism, please consider supporting our work by becoming a member of the Appalachian Preservation Project. Just roughly 100 years after the Catawba Valley was permanently settled by European settlers, numerous factors contributed to open the mountain markets of the southern Appalachians to the Piedmont of North Carolina and beyond. These factors also permanently linked the late-developing town of Hickory to the mountain communities of the Blue Ridge Mountains. In the process, Hickory, though it was at first a small town in a county where political power was centered 10 miles to the southeast in the Catawba County seat of Newton, quickly became the economic hub of the Catawba Valley. Hickory’s development occurred because its founders did not allow the Catawba River to serve as an obstacle to growth, and instead saw it as an opportunity to energize the region’s economy by improving transportation to the mountain markets and to the more populated cities to the south and east. Consequently, it placed itself squarely between the mountain forests, farmers, artisans and craftsmen and the rapidly growing cities of the Piedmont. First there were fords, followed by ferries. Then bridges crisscrossed the valley’s many streams, making way for local trade. 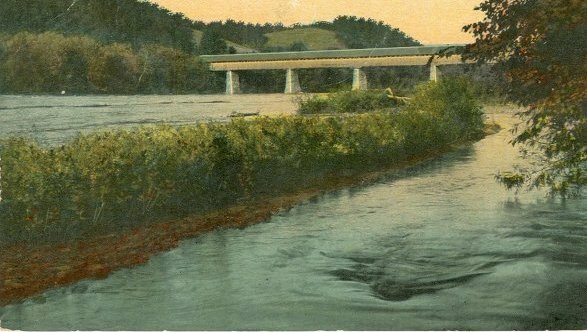 The first significant improvement occurred in 1849, when private investors built the Horseford Bridge, connecting Hickory to Caldwell County. The next significant development was the arrival of the railroad. In a debate about whether it would be routed through Hickory or Newton, a compromise was made in which both communities were included; Hickory would be on the main line and Newton connected by a spur. Other spur lines were added to connect with Maiden and points south. It was the development of these vital transportation links that helped make Hickory a commercial gathering place. The early, modest village was to quickly grow beyond the few blocks surrounding the train depot. Soon, hotels were built near the depot for the ever-increasing number of visitors. Local residents such as Abel A. Shuford moved from the countryside to the town, bringing with them their leadership, entrepreneurship and philanthropy. The development of the lumber industry, the establishment of Piedmont Wagon Company and the robust trade at Union Square all signaled a community poised for regional influence. The arrival of electricity, the founding of local banks, and a strong emphasis on education helped usher in an era of growth and optimism as the 19th century came to a close. None of this would have been possible had the city not been connected to the Blue Ridge Mountain communities. The region’s robust agrarian economy had sustained it for 100 years and had created strong communities. Stores and shops opened, as merchants were needed to provide equipment and supplies for home and farm. While Newton, Maiden and other towns throughout the valley had numerous merchants and craftsmen, the small community known then as Hickory Tavern would be among the last towns in the county to be officially established. However, the building of the bridge and the arrival of the railroad helped to expedite its standing. Although the arrival of the railroad around 1860 was undeniably significant – connecting Hickory with markets to the south, east and west – the essential first step in the establishment of Hickory as a vital market place was the building of the Horseford Bridge. “Early on, settlers in the northern mountains pushed a path down to the river at what became known as ‘the horseford,’ named for the fact that horses could make it over, but wagons had a rough time” (Freeze 265). For years, valley residents had to overcome the challenges that came with the streams that created their rich farmland. “That persons of the section of Catawba desired to cross streams is evidenced by the astounding number of ferries which operated shortly after the county became a governmental unit, some of them for financial gain. Between 1850 and 1900, it is estimated that 20 ferries and toll bridges were at the disposal of the citizenry. Numerous fords were also used” (Preslar 162). Dozens of crossings were available on the Catawba, the South Fork had five crossings, Henrys Fork river had numerous and Jacobs Fork had at least two. Hickory was now a marketplace for produce, vegetables, wheat and other crops. Lumber, too, was being harvested. The bridge brought the farmers; the railroad provided access to customers. Hickory was now “…emerging along the tracks” (Freeze 171). Hickory did far more than emerge. It boomed. Indeed, “The inimitable ‘great iron horse,’ which made its appearance in North Carolina in the early 1840s…is credited with developing Catawba county more effectively than any other transportation facility and determining that Hickory is the area’s principal city” (Preslar 164). In 1860, the Western North Carolina Railroad (WNCR), and later the Carolina and Northwestern RR, “…changed Catawba as much as did the Civil War. The impact of trains during the postwar decades fostered the growth of towns in an overwhelmingly rural county. Catawba was still primarily a farming area by 1900, but the towns – Newton and Hickory in particular – exerted a cultural and commercial power that gave them sway over the county’s life. The concentration of schools, stores, and shops around the railroad stations set the stage for the later development of industry and an urban culture” (Freeze 213). Prominent families moved from the countryside to the town, helping lead its development. Meanwhile, others remained on the farms, recognizing that the rail lines opened their crops to markets heretofore beyond their reach. Farmers were not all that benefited from Hickory’s emergence. In time, industry would build up, and education and the arts would thrive as well. Upon arrival of the railroad, a post office was opened for “Hickory Tavern,” the original name of Hickory. The same year that the city officially adopted its new name (1889), the first street lights became operational in the city. Two years later, what is today Lenoir-Rhyne University opened its doors as Lenoir College. Shortly after the turn of the century, construction had begun on public works and sewer facilities. The first local telephone exchange was housed in Newton in 1900, over A. A. Shuford’s bank in Newton, and by 1908, a street numbering plan was implemented. From 1860 to 1900, the railroad continued to grow. The railroad not only strengthened Hickory, it set it up as a regional hub. During the Civil War, the Hickory depot had served as a commissary for the Confederacy. After the war, Catawba, Claremont, Conover, Maiden and Newton had grown with the arrival of the rails. Though Newton was the county seat and at the geographical center of the county, Hickory was clearly emerging as the economic leader in the Catawba Valley. In fact, the Hall Brothers, the leading Hickory retail and wholesale merchants at the end of the 19th Century, enjoyed more business than the top five Newton competitors (Freeze 235). Yet, Hickory was still very agrarian and charming. “Early Hickory was so small…that when the train blew its whistle twice daily, most activity stopped, and someone from every household gathered at Shuford’s store, where Dolph, the postmaster, called out the names of those receiving letters. So intimate was the community that young blades would ring the depot bell well into the night after a wedding, just to remind the couple folks were thinking about them” (Freeze 270). Within a few years after the Civil War, Hickory was attracting people from throughout the state and region. “Through the mix of farmers and merchants Hickory suddenly became the boom town of western North Carolina. ‘The growth of Hickory is astonishing,’ Statesville newspaper editor E.B. Drake told his readers in January 1872. ‘New houses are going up on all directions. Business is flourishing’” (Freeze 271). Indeed, at about this same time, Dr. Richard Baker began practicing medicine in Hickory, which during this time also included the opening of a drug store. He proudly placed a “card” – or advertisement – in the local newspaper announcing his practice. Payment commonly consisted of fruits and vegetables, and Dr. Baker, known for his charitable deeds, would have certainly bartered or performed care without payment. An event in the history of the Horseford Bridge also signaled a determination by Hickory’s leadership to recognize they had a vital role to play in the town’s growth. Within a generation of being built, its value was such that the town acquired it in the 1880s, “…when the heavy traffic on the structure led to the town’s decision to buy it and allow free crossing” (Freeze 268). The Piedmont Wagon Company was Hickory’s first major industry and was a key to the town’s growth from 1880 to the 1920s. Prior to the establishment of the Piedmont Wagon Company, small wagon and blacksmith shops dotted Catawba County. Work in these shops, usually located at crossroads, was all done by hand, whereas much of the factory’s work was done with the aid of machines. George C. Bonniwell (1837-1912) is generally credited with establishing the company. An architect, engineer, and builder, Bonniwell came to North Carolina from Philadelphia in 1878. He found a business partner in the person of Andrew L. Ramseur, the operator of an iron forge, gristmill, and sawmill on the Catawba River. The original site of the factory was located at the intersection of the Western North Carolina Railroad and the Chester Lenoir Narrow Gauge Railroad. The present-day building is located on a slight knoll in the angle formed by the two sects of railroad tracks. The location was thus ideal for the growth of the business. As the company prospered, its physical plant, spread over the thirteen acres, increased in size. … At its height the primary markets for Piedmont’s products were eleven southeastern states, extending from Virginia to Texas. Output increased to one thousand wagons per month. This was from a business which originally produced one wagon per week. Source: City of Hickory, N.C.
Another important development in Hickory’s emergence was the establishment of the Piedmont Wagon Company. Founded about 1878, it helped launch manufacturing in Hickory, helped expand its center westward, and “…made Hickory nationally famous for decades” (Freeze 280). Located about a mile west of the depot, it sat strategically at the junction of the rail lines. Its proximity to town helped ensure its access to mountain forests and growing urban markets; its location helped guarantee that it had access to timber to the north and west. “Soon after the establishment of the wagon yards, other industry began to be located at the western end of town. Most firms concentrated on products using the raw material that made Hickory tout itself as ‘the woodman’s mecca’” (Freeze 283). In short, Hickory went from an ante-bellum village to a prototypical town of the Gilded Age, primarily because of the railroad; early maps and photos of the town bare this out, as the initial activity and development were around the train depot. Numerous fires in each decade following the Civil War shaped the architecture and impacted the fortunes of numerous merchants. Several businesses – most famously hotels – as well as churches and homes were destroyed by fire. This led to the development of a fire brigade, the precursor to the Hickory Fire Department, which by the first decades of the 20th century was being lauded as one of the best in the nation. Also, most destroyed buildings were eventually replaced by brick structures, many of which still stand today. Hickory was a segregated town as were all Southern towns during this period. Yet, there apparently remained a sense of community. “All residents of early Hickory were, in one way or another, neighbors. Rich and poor alike, and sometimes black and white, lived within sight of one another” (Freeze 290). It also experienced growing pains. Livestock roamed the streets when farmers were in town waiting for the train. In addition, “Hickory was a rowdy town, with taverns freely dispensing alcohol and civil order sometimes barely enforceable by the local police. As one resident stated it, ‘Hickory was a veritable frontier village. The plains of the wooly West did not surpass it in its will orgies of lawlessness’” (Freeze 293). Conversely, faith also played a role in the town’s development with Presbyterians, Lutherans, Baptists and Methodists establishing churches after the first congregation – that of Corinth Reformed Church – had organized in 1869. Indeed, Dr. Baker and his wife played significant roles in the establishment of the town’s first Episcopalian parish. There was also a determination to provide rigorous educational opportunities, recognizing the value of common (now public) schools as well as higher education to a community’s economic and cultural growth. Consequently, “By 1892, Hickory had become one of the gems of the New South. The Opera House joined with the Hickory Inn and the new bank to give the community an air of Victorian prosperity and sophistication. In 1889 Hickory was officially chartered a city. …It also chartered an electric light system. The street in front of stores on the public square was about to become Park Place, and in 1892 the area would take the name Union Square” (Freeze 307). The seemingly endless supply of timber led to a robust furniture industry, including sawmills and factories. Investment by local entrepreneurs and even New York capitalists placed Hickory as a leader in the industry as the 20th century dawned. “By the early 1900s Hickory had developed several (furniture) plants, the first being Hickory Furniture Company in 1901. …By the eve of the first World War furniture had become the town’s leading employer” (Freeze 364). The growing economy of the region and the entire South, with farmers experiencing solid, steady prices, helped Piedmont Wagon enjoy some of its most prosperous times. By 1880, the population was 1,400 and Hickory was the busiest town between Asheville and Salisbury. Textiles and hosiery mills were opening regularly; several plants would open in the early 1900s. Suburbs also began to develop. Windy City (now Viewmont) was to the north, Brookford to the south, Highland to the east, and Longview and West Hickory to the west. Eventually, all but Brookford and Longview would be absorbed by Hickory. Still, the depot area remained the town’s focal point. Union Square was growing, funded largely by industrialist and philanthropist A.A. Shuford. Indeed, the Shufords were playing an increasingly active role in the community. “The Shuford enterprises embraced furniture, gloves, hosiery, textiles and banking. And there was Shuford time, energy and money, too for establishment of schools, churches and other civic institutions” (Our State 27). The town and world was rapidly changing, and the next generation was charged with leading Hickory into the uncertain future of the fast-paced 20th century. City elder A.A. Shuford died in 1912 in the hospital founded by his nephew, Dr. Jacob Shuford. Just a day previous, A.A. Shuford’s brother and Dr. Shuford’s father, John, also died at the hospital. Earlier, in 1906, Dr. Baker died – five years before the hospital that would honor his life’s work would open. Though passing on, the influence of the town’s founding generation was far from over. The foundations they had laid through a lifetime of service following the decades of the Civil War were solid. The progress under them was impressive. The example they set was exemplary. In short, all that was needed to support a modern community – infrastructure, population, a sense of community, a strong economy, vital social and educational institutions and a new generation ready to embrace their season of opportunity – was in place. Hickory had become a gathering place. A front page of the local newspaper from 1911 included the train schedules. Folks could get to and from Hickory from places like Gastonia and Lincolnton in the Piedmont and Collettsville, Mortimer and Edgemont in the mountains. Just roughly 60 years after the Horseford Bridge was built, and 50 years after the railroad arrived, Hickory had become the regional hub for the Catawba Valley, because its leaders recognized the importance of its mountain neighbors. Gary R. Freeze, The Catawbans: Crafters of a North Carolina County (Newton, N.C.: Catawba County Historical Association, 1995). Charles J. Preslar, Jr., editor, A History of Catawba County (Salisbury, N.C.: Rowan Printing Company, 1954). The State magazine, April 18, 1959. The Catawba Valley is a river basin fed by the creeks, streams and rivers tumbling down the Blue Ridge escarpment. Though actually in the foothills of the Appalachians – also known as the Piedmont (though over time, those terms have come to mean two different regions along and beyond the Blue Ridge) – the Catawba Valley’s settlement was essential to the economy and growth of the southern Appalachians, especially in western North Carolina. Today, its economy is on unstable footing, as many of the furniture and textile companies which employed tens of thousands have closed. This is not the first generation to find challenges in the valley. The swift and rocky waters of the Catawba River presented a formidable obstacle for the first European pioneers wishing to settle the western shores of its rich valley. However, the pioneering spirit guiding Adam Sherrill would not allow the river to stand in the way. The family had trekked through the wilderness of Virginia and North Carolina to find a home, and the rich rolling hills and fertile fields formed by the river valley offered everything an industrious farmer would need. A pastoral environment, it offered not only the soil, rain and sun needed for productive fields, it also offered peace and the opportunity to prosper – all that a pioneering family could ask for. Not surprisingly, many others immediately began to settle the valley. Eventually, the river, rather than being an impediment, was the life source for those living alongside its shores and tributaries. While those who first forged the river at present day Sherrills Ford in southeastern Catawba County could not have envisioned the Catawba Valley today, it nevertheless is their legacy. Through their determination and industry, through a belief in self-reliance tempered with a reverence for God and stewardship of the natural resources afforded them, the first settlers – mainly German but also many Scotch-Irish and others – established not only a community, but a lasting set of values that continue to help guide it more than 250 years after they first arrived. Among the first to arrive were the Schufferts, the ancestors of Dr. Jacob Harrison Shuford, who founded Richard Baker Hospital in Hickory in 1911. In 1760, western North Carolina was a wilderness, as evidenced by the top map. However, as is clear in the bottom map, by 1850 Catawba County’s borders were established. Clearly, the early settlement by the Sherrills and other early pioneers to the Catawba Valley paved the way for rapid growth of the region. © Division of Archives and History, North Carolina Department of Cultural Resources, Raleigh, N.C. However, they were also accustomed to densely populated villages in Germany. Conceivably then, a primary draw to the valley was that it was not yet crowded with villages. The large river offered protection and fertile valleys; its many tributaries formed subtle yet beautiful slopes, hills, valleys and plateaus. Indeed, today, in a few areas of the county, the countryside remains remarkably similar to what the first settlers encountered. At first, settlement was deliberate, largely because of the unknown wilderness, and also because the migration from Pennsylvania was initially small. Immigration to the New World with an entire family and all of its belongings in toe was a physically-demanding, uncertain route to a new life. Yet, the Schufferts chose the new life and all the challenges that came with it. “Many families from the area around Langenselbod (Germany) made the journey to America, among them, Johan Jerg Schuffert and his family.” By the 1750s, the Schufferts had also settled on the western side of the river, though several miles further west than the Sherrills. Though they would have followed the same route as the Sherrills much of the way, it is possible they took the more western Island Ford route that branched off of the Sherrill’s path just north of the Yadkin River in present-day Iredell County and crossed the Catawba River several miles upstream from Sherrills Ford. “In early 1755, George Shuford and his family left Pennsylvania, accompanied by the families of his son and daughter, and traveled to the western part of North Carolina (on what was known as ‘The Great Wagon Road’)….In September 1755, he bought 500 acres on land from Samuel Wilkins on the south side of the South fork of the Catawba River. This is the land he is buried on today.” Today, the old family cemetery remains, not far from the South Fork River. It is there that Johan Schuffert died in 1762. He had taken his family about 435 miles from their settlement in Pennsylvania. Little did he know how far his family, fellow settlers and their descendents would carry a community over the next 250 years. The countryside – while full of challenges – must also have offered tremendous hope and opportunity, at least as viewed from the highest point in the county – Baker’s Mountain. Today a county park, its trails and vistas offer not only a peaceful break from the hectic lifestyle for area residents, it also offers a peak into the past and what the Shufords and their early neighbors saw stretched before them. To the west is a narrow valley, greeted on the far side by the steep slopes of the South Mountains, a narrow, fingered prong of the Blue Ridge Escarpment. To the north, in the distance, are some of the highest peaks of the Blue Ridge; the imposing slopes providing life to the Catawba River Valley from its countless tributaries. To the east, the ridges gradually give way to the rolling hills of the Piedmont, but not before stubbornly holding ground, forcing the river to bend hard to the south. It was not far from Baker’s Mountain that the Shufords settled, on a 2,000 acre tract of land along the South Fork River. It offered bottom land, forests, hilltops, valleys and streams. Today, remnants of the homestead remain. Wood was essential not only for the cabin, but also the furniture, utensils, tables and benches. Woodworking then, was an essential skill. Cooking was done over open fires. Clothing was home made, as was soap. Though a life of work, there were also times of merriment, as events accompanying farming or church life were also often festive and social occasions. The Revolutionary War strained relationships among not only neighbors, but families. Yet, the importance of community, their common faith and interdependence led the families of the county’s various townships to eventually overcome the divisions brought about by the colonial revolt. Language barriers between German-speaking and English-speaking immigrants proved difficult. Eventually English became predominant and the spelling of Schuffert was changed to Shuford to accommodate English-speaking sensibilities. The challenges of agrarian living, with the many chores required of all family members, provided many practical learning opportunities, but still did not allow much time for formal instruction. Hence, a learned preacher would be the logical choice to entrust one’s children to for “book learning.” Of course, the elders almost certainly would have closely monitored the instruction provided the children, in particular on theological matters. Eventually, by the early 1800s, several private schools were listed throughout the county. “Location of the schools generally followed the walking patterns of the neighborhoods.” In fact, while the teachers recruited to some of the schools were met with resistance as they brought in ideals and ideas not necessarily aligned with those within the community, their work was a forerunner to the common schools, which began operating as North Carolina’s first public schools circa 1840. The river and tributaries were not navigable; therefore, with the exception of local trade conducted via canoe or the occasional pole boat, they were not travel routes. Foot travel was along established trading paths of the Native Americans and later from home to home and home to church. Pack horses hauled freight along the same routes, slowly expanding the markets from settlement to settlement. Wagons soon followed. What had been one-foot-wide trading paths were now rutted roads, carrying produce, lumber and durable goods. “It is believed that the earliest road of the Catawba territory was the State road, the Catawba county portion of which was constructed in 1763. The road entered Catawba county in its southwest part, traveled in an easterly direction through Bandys, Jacob’s Fork, and Newton townships, to and through the present town of Maiden and on east to Sherrills Ford.” Interestingly, Jacob’s Fork is named for the aforementioned Jacob Shuford, an ancestor of the hospital’s founder by the same name. Later, such professionals would play a pivotal role in establishing and developing Hickory. However, as the county was first settled, what is now known as Hickory was of little consequence. A license to operate a tavern was granted to John Bradburn, circa 1784. He built what became Hickory Tavern alongside the road that had been constructed about 15 years earlier. It is not certain how the town got its name, though it is commonly – though not universally – believed that it was near a notable hickory tree or perhaps a stand of them. In any event, what is today downtown Hickory was then but a building or two. Yet, in 1849, just about 100 years after the first settlers forged the Catawba River, Hickory would become a center of commerce and trade, facilitated by the opening of the Horseford covered bridge into Caldwell County. This event opened up markets and opportunities heretofore not possible.